I picked up this book as a little personal challenge – to try something new, to read something as bit different from what I would normally read. And I have to say that the setting – the city of Kabul in Afghanistan – made me feel a little uncomfortable to begin with. It’s a fictional story written by Deborah Rodriguez, who based many of the events and some of the characters on her own experiences whilst she lived in Kabul years prior to writing the book. Sunny, the main character, is an American lady who has a coffee shop in the unsettled city of Kabul. She caters mainly for westerners, including American and British soldiers, as well as journalists and the odd tourist. I guess I found it a little hard to fathom what life would be like in a city where women are forced to cover themselves completely, as well as being seen as merely sexual objects and slaves who are rarely allowed to speak, let alone make any life choices of their own. These characters are also facing the daily fears of suicide bombers and the Taliban – who essentially run the country. In between all this negativity and uncomfortable setting, the characters are quite well-developed and diverse. Rodriguez manages to incorporate some hope, some positivity and of course, that conventional happy ending that we are all so craving. I can see this becoming a movie down the track, full of colour and texture and interesting characters who play out an engaging storyline. I rate this book 7/10 Worth a read. 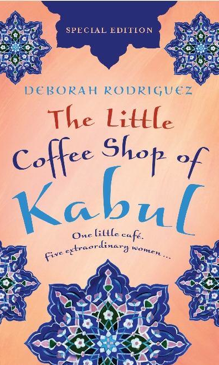 This entry was posted in Love and tagged book review, Deborah Rodriguez, The Little Coffee Shop of Kabul by sewandbakeandlove. Bookmark the permalink. I borrowed this book from our local library a year or so ago, based purely on the cover… I know I know, should never judge a book by its cover… and as the librarian scanned it for me she said ‘Ohhh you’re going to LOVE this’. Love a good book. Will have to give this one a go!! I also read this book a couple years ago, as I was living close to the town where the author was from. I enjoyed her other nonfiction book as well. I really enjoyed this book also and thought it was so inspiring. A great story of friendship based in a dangerous and difficult place. I only recently read this book and also wrote a review on my blog (anitasbookbag.co.uk) if you would like to read it.